The fifth Dewi-Prys Thomas Prize will be awarded at a ceremony on Friday, 27 November 2015 at Ruthin Craft Centre in the Education Room at 18:30, before the exhibition openings that evening. All are welcome to attend. • Professor Rhiannon Evans, Trustee, The Dewi-Prys Thomas Trust. 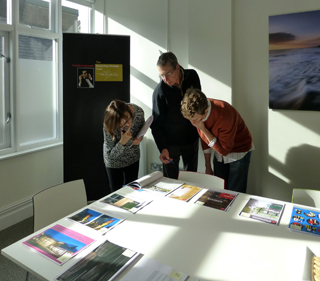 The main judging day was on 23 September 2015 and was kindly hosted by the Royal Society of Architects in Wales at The Creative Quarter, Morgan Arcade, Cardiff. The short list for the Dewi-Prys Thomas Prize 2015 has been drawn up. Thank you to all of those individuals and organisations who took time to enter. Cardiff and Vale College Community Campus, Cardiff. To download the press release, which contains information on the short list for the Dewi-Prys Thomas Prize 2015, please click here. 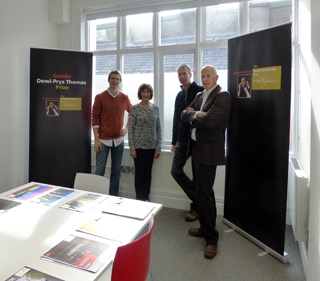 To download the postcard inviting entries for the Dewi-Prys Thomas Prize 2015, which will be available at many cultural venues throughout Wales, please click here. 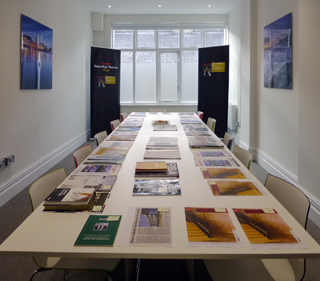 To download the Call for entries for the Dewi-Prys Thomas Prize 2015, please click here. The Dewi-Prys Thomas Prize scheme for 2015 was launched by Rhys Llwyd Davies and Professor C Malcolm Parry at an event in Y Lle Celf, the National Eisteddfod of Wales, Montgomeryshire and the Marches at 16:00 on Monday, 3 August 2015. The Trust is grateful to all those who attended and thanks the National Eisteddfod of Wales, Royal Society of Architects in Wales and the Design Commission for Wales for kindly allowing us to participate in the event.